It was slate thins. The wall piled and wedged with expert skill; each slate picked with care to fit the ones above, below and between. Barely a sliver of mortar was necessary between each thin slab. Each slab itself carefully split with metal wedges like leaves of ancient oak. The stonemason’s rough hewn fingers had moved with the delicacy of an artist; he knew exactly where the correct fissures in the rock lay. Fissures built by the compression of time. Centuries it took to lay down the slate. Centuries of stone waiting to be blown from the cliff-like quarry wall. Centuries of stone waiting to be cut and splintered like simple ice shards. Centuries of stone waiting for the generational skill of the stonemason’s fingers to imprint themselves upon it. The stone invisibly soaking itself from his skin like a solid sponge. Working it’s magic. The stonemason had worked quickly with grey bearded experience. He had driven his wedges into the thinnest of gaps. Gaps the untrained eye could scarcely detect. He sometimes felt an affinity to the ancient shipwrights who, in days gone by, had split the perfect oak for the keel of the tallest tea-cutter. He knew his art and with sadness he wondered if such art was dying. The sadness filled him when he stood on a dock and watched the bleached old rotten ship being stripped of its obsolete precious wooden planks. The stonemason knew his art perfectly, like the ancient slate he fashioned he was connected to the past; the years of endeavour of the many craftsmen before him. His sadness was the realisation that such connections would be broken. His art would be lost and he despaired that his life’s work was to be replaced by the quick-buck processed roof slates of the new factory. There would be no love and care in such mass produced tat. No art, no beauty of the craft. No satisfaction. I could feel that sadness as I barely dared to skim the wall of that Welsh cottage with the very tips of my fingertips. His sadness jumping to my fingers like tiny electric sparks. His disappointment. His son’s lack of willingness to learn. A whole life of plying his trade would be lost. Lost to the creeping tobacco cough of cancer. The roll-up yellowing his fingers even as he split the last grey slates. I felt that cough in my lungs too. Death approaching, snail-like beneath the surface of the quick movements of fingers, hammer and wedge. The builder was there too, deep in the cracks. His too was a skilled hand. An old hand. In each buttery spread of mortar he described his loneliness. It was like a soft pad beneath every inch of his skin, a bloated heaviness he could feel with each stroke of trowel, each wondrous placement of stone. His careful eye choosing slates from the pile. He would always know, even without consciously thinking, which was the perfect stone to fit next. The experience of years told him the wall would last, standing firm. These things he knew. He would never know, however, the touch of another; his firm hands made only to touch stone. Only stone. And this in turn, over the silent years, had solidified his lonely heart to stone. If you work with stone, then stone is all you know. So that, eventually, you become stone. This I could feel too, brushing my fingers lightly over the slate. I understood his loneliness. How could I not? And yet I still feared, as I stood alone in that low-ceilinged old cottage. 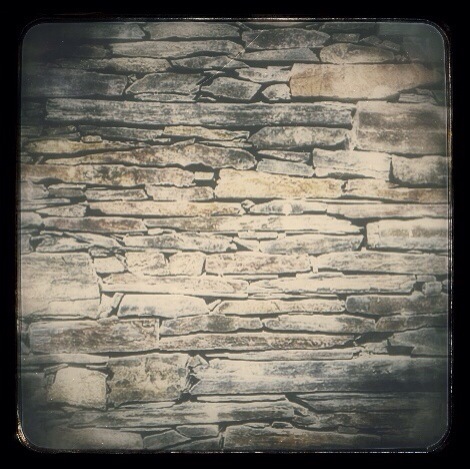 I feared to place my palm, fully against the most perfect of slate walls. A crafted wall of beautiful symmetry filled in every crack and surface with sadness. What else did it possess?